It's been quiet here for a while... I've been up to my neck in job stuff - and when job stuff equals drawing dinosaurs you really don't feel the need to do anything else. But today is a special day. Just a few hours ago this blog passed the one million views mark. I think huzzas are in order! 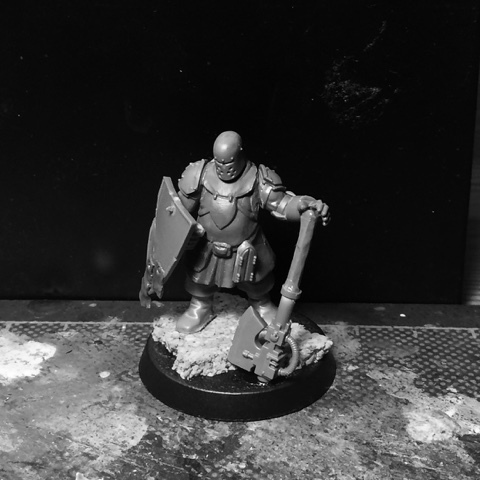 To celebrate this momentous occassion here's a sneak peak at a new character for my outgard retinue. Well deserved, you do inspirational conversion work! Finaly, welcome back ! And wow, 1.000.000 views ? All hail the Convertorum ! Congratulations, Johan! That is an incredible achievement -- colour me jealous. Bah, who am I kidding: You've really earned it! Keep up the amazing work! You're always a huge inspiration! Cheers guys! Thanks for all the huzzas and words of encouragement! New fig looks suitably imposing.